Keep going... Difficult roads often lead to beautiful destinations. All we can do is follow the road that God is with us on do the best we can. Please God take my hand I need you help with a little of every thing. With God's guidance everything will be alright. Keep On Keeping On! Enjoy every day as if it is your last. Difficult roads often lead to beautiful destinations picture/image is an Inspirational Stuff to Inspire and Motivate You. You can download pics by just clicking on the Images. Thanks for visiting Truth Follower an online place for huge collection of inspiring pictures, quotation, and Sayings Images. 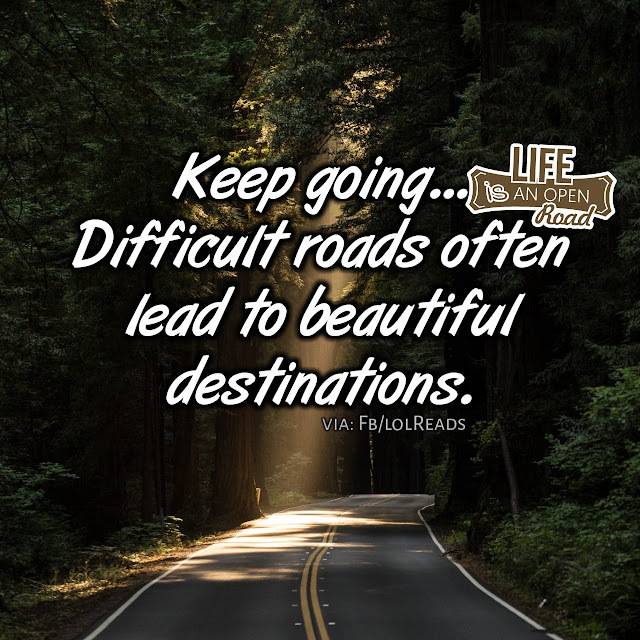 If you like Difficult roads often lead to beautiful destinations, Please Share with friends and family on Facebook, Twitter, and Pinterest.